George was an older gentleman who lived in a southern state not too far away from me. He was retired and alone – his wife having died several years previously – and lived in a shotgun house1 which was sandwiched between the homes of two religious-minded people. Now, George didn’t feel that way about his young neighbor on the right – a nondenominational Christian student of the Bible. In fact, George enjoyed talking with this man. Why? Well, that Bible student realized that his job wasn’t one of conversion; it was to witness. “You will be my witnesses, telling people about me everywhere,” said our Lord (Acts 1:8, NLT). A witness, according to the dictionary,2 is someone who has personal knowledge and gives evidence or attests to a fact or event. And that is what the young man would do when talking with George; he would discuss what biblical knowledge he knew, but only when asked or if it came up in conversation. Not only that, but he would listen to the thoughts that George would express without condemnation. Both he and George would have mature discourse, all without trying to convert, convince, or sway each other one way or the other – just an exchange of thoughts. The young man would explain that everyone should use their own free will to come to any conclusion about something. That is the kind of witness we should be; we should testify and give evidence about God and Jesus Christ and not be aggressive in demanding that our own ideas are accepted. Trying to manipulate someone into changing their mind is social control and convincing someone that there is something special to be had in certain religious denominations is much like Satan trying to deceive Eve in the garden of Eden. God wants us to follow his laws because of our faith and free will. We should do our best to show, in our own lifestyle and in our actions, the things we have learned in God’s holy word, as best we can. We can do some of our better preaching by living the commandments given by God and the traits exhibited by his son, Jesus. And, when a proper opportunity appears, we tell others about this Good News and all the wonderful promises included in God’s divine plan for humankind. No matter how sincere or intentioned our zeal may be, it would do little good to antagonize someone in an attempt to persuade a change of heart. 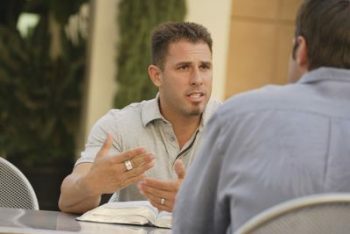 So, when we talk to someone, we don’t try to cram information down their throat and we don’t hammer away at their beliefs to get them to accept Bible truth, or twist their arm to get them to convert to our way of thinking. This man, George, is now a real student of God’s word. He became one, not through the irritation of forced conversion, but because of a real desire for a closer relationship with God and his son. This desire was aroused by seeing, in someone else, the kind of person he wanted to be. All people are free moral agents and each must make up his own mind concerning these matters. George did. But not all people will choose as George did; many will choose not to learn biblical truth. It is not for us to make these decisions for others — it is for them, alone. 1. A “shotgun house” is a narrow rectangular domestic residence with rooms arranged one behind the other and doors at each end of the house. Author’s Note: The name comes from the idea that you can shoot a shotgun from outside the open front door and hit something outside the open back door. 2. Merriam-Webster’s Collegiate Dictionary, 11th Edition, (Springfield, MA: Merriam-Webster, Inc., 2003). 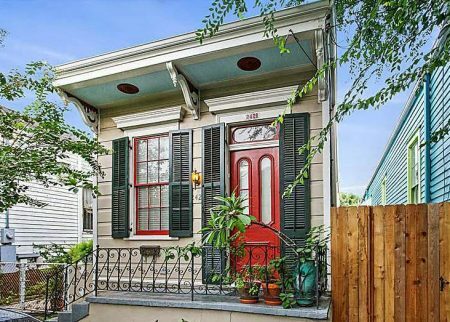 I used to live in NOLA as a kid and in a shotgun house. A lot of good memories down there. Nice post. Thanks for the nice comment on the article. For those that may not know, ‘NOLA’ is short for New Orleans, LA.